I’m back with a fresh paper rose flower design! The large garden rose is a great variation from my smaller paper rose and it was a joy to design. When in full bloom, the leaves of a garden rose are just beautiful and that delicate quality was fun to re-create in paper. My top trick is to gently curl the leaves with the blunt edge of my scissors before assembling the flower. But a second, and equally important trick, is to print a pretty watercolor pattern onto the paper before cutting. These tricks help to create dimension and depth to the flower and turn a flat piece of paper into something full of life and texture. UPDATE: This flower design was featured on AM Northwest! To find the free blush and copper rose template check out this post. This is such a basic question I’m embarrassed to ask, but, I’m trying to make small, low centerpieces for my mother’s 90th birthday celebration. I’ve made your peonies, full bloom Rose’s, cosmos, mums and Gerber daisy. They all turned out beautiful, not as pretty as yours, but really pretty. I just don’t know how to make a simple arrangement. I need to do 20 tables. I’m really bad at it! Do you have a suggestion. I haven’t purchased containers yet, but I was thinking about a small 4×4 or 3×3 square or round vases. Any suggestions would be so appreciated! Thank you! Don’t be embarrassed! Flower arranging is tricky. I have a few posts with some tips you might find helpful: https://liagriffith.com/make-flower-centerpieces-from-crepe-paper-peonies-and-real-flowers/, https://liagriffith.com/arranging-a-paper-flower-bouquet-video/, https://liagriffith.com/make-a-gorgeous-rose-arrangement-from-grocery-store-flowers/, https://liagriffith.com/how-to-mix-paper-flowers-with-fresh-leaves-and-lavender-to-make-a-gorgeous-fragrant-bouquet/, https://liagriffith.com/paper-garden-flower-bouquet/, https://liagriffith.com/diy-wedding-bouquet/. Add some greenery (paper or real!) and just play. Once you come up with a creation you like, you can repeat it for each table. 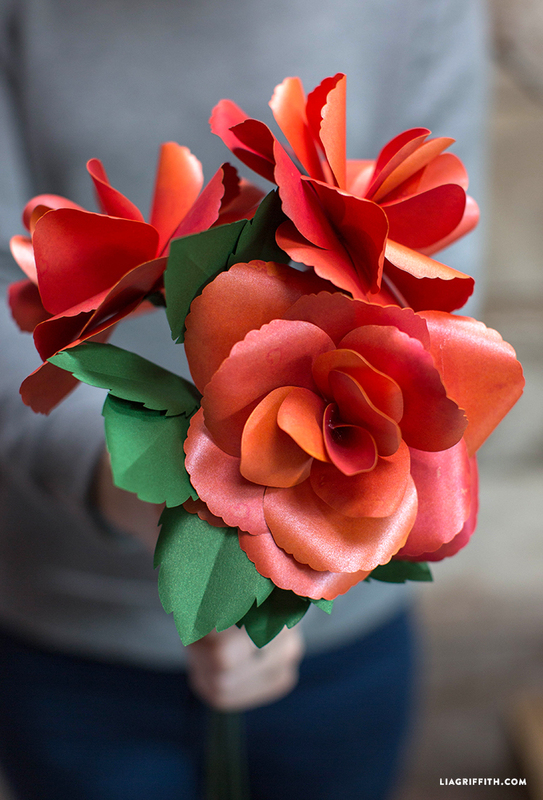 Can you provide some more instructions on how to attach the green backing to the petals? I’m having a hard time visualizing it. I have tried to download several days apart (svg) and the file does not appear. me or is there an issue? Oh no! We haven’t heard this from anyone else, and I just checked the files myself and was able to access them just fine. You could try a different web browser, as some (Internet Explorer, for example) don’t work as well. If you still have trouble, send an email to hello@liagriffith.com. Do you have any tips for transfer the pattern to paper without printing on each individual piece of paper? Print the pattern onto a card stock, cut it out and trace around the pattern. I use Paper Papers brand text weight metallic paper for my paper flowers. 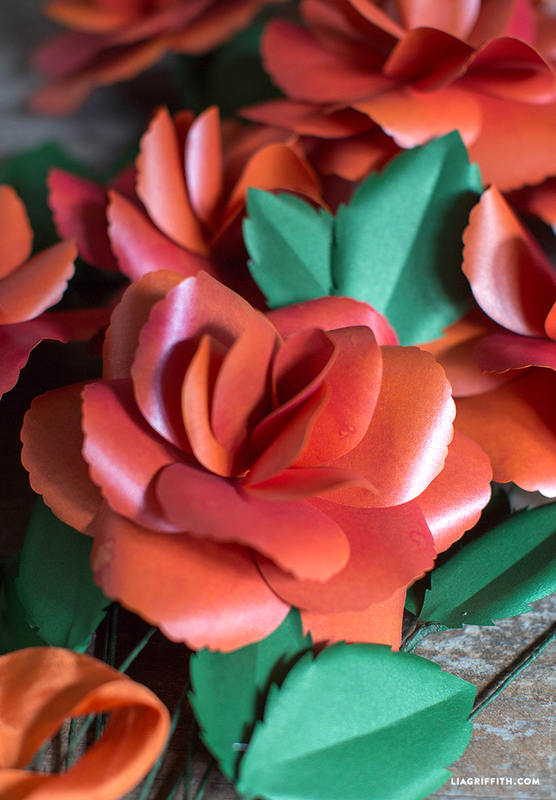 It has a beautiful sheen and it is the perfect thickness to make gorgeous flowers! The green backing where the wire and the rose meet is missing on both the PDF and SVG. Do you have the measurements so we can make one? Love the roses and the wash.
gorgeous as usual. we are not expecting anything less. The orange/pink is now there, but I did not print anything on the green paper for the leaves. Hi Lia – I think Jaqueline meant the jagged green piece you used to cover where the wire connects at the back of the flower – this one piece is missing from the pdf/svg. Do you have the pattern for this? These are so beautiful! Where do we find the watercolor wash download? So very beautiful and stunning Lia. 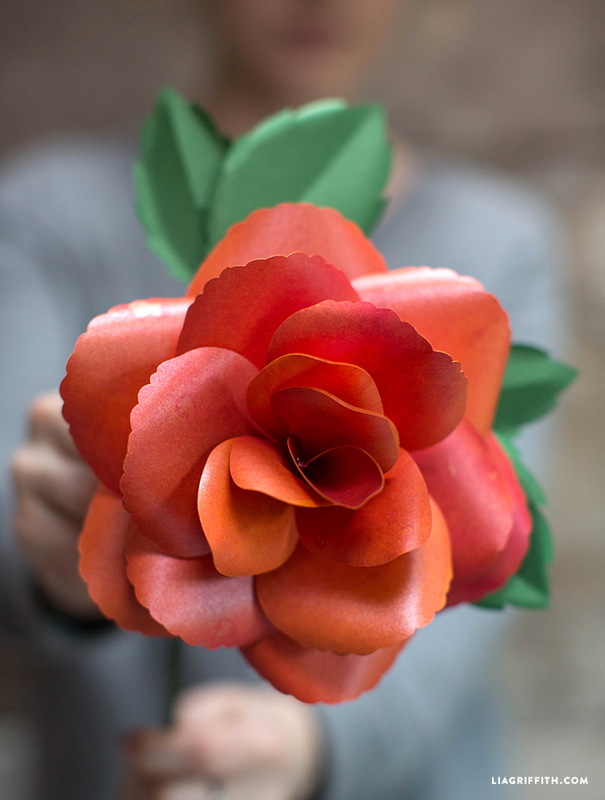 These roses look so real especially with specially colored papers used. I love them and I’ve not been a rose lover but these sure change my mind. Spectacular design. You KNOW I love the paper roses!!!. Did you see my email earlier about doing my tree in red roses and Swarovski and snowflakes. Omg I think I’ve gone over the edge!!! Yes! I just sent you a response. I am soooo excited to see what you do. You are so talented. Now I could be wrong or blind, but I don’t see the color wash download. Also, do you plan on ever putting up just the outlines for the regular paper tulips? I’m plan on doing paper flowers for teacher appreciation week next year, and most of his teachers like tulips. I don’t want to give them all the same one. Email:* Your email will not be published. Get your dose of happy mail from Lia. Lia Griffith is a designer, maker, artist, and author. Since launching this handcrafted lifestyle site with her first paper rose in 2013, Lia and her team have developed thousands of original designs, templates, and tutorials for those who love to learn, make and create. 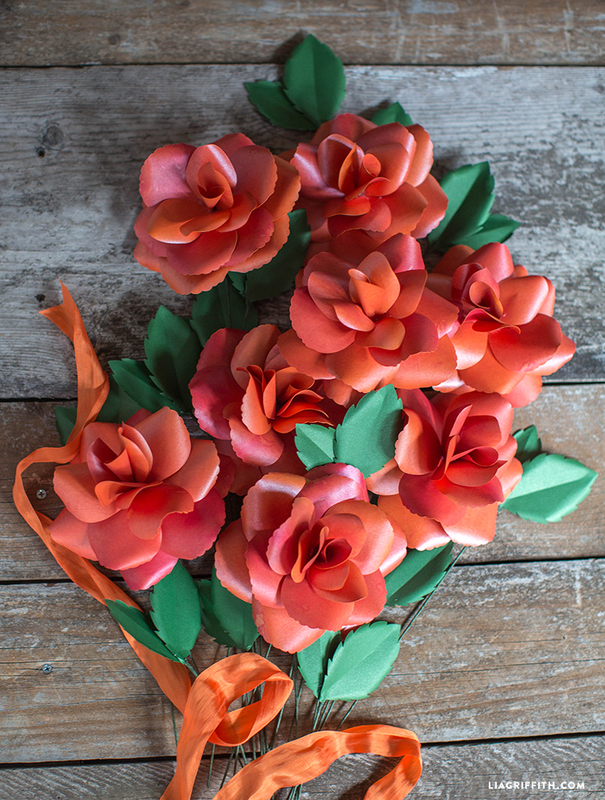 While paper flowers are where this journey began, Lia is most passionate about helping others find joy in crafting and reopen the door to their creative soul. She believes in changing lives one craft at a time. We offer multiple options for downloading our projects - click here to find out more about joining our crafting community! Join us today to watch this video! You are now a member and have access to exclusive content and project downloads. We're glad to have you on board! Get the downloads for this project with a membership. 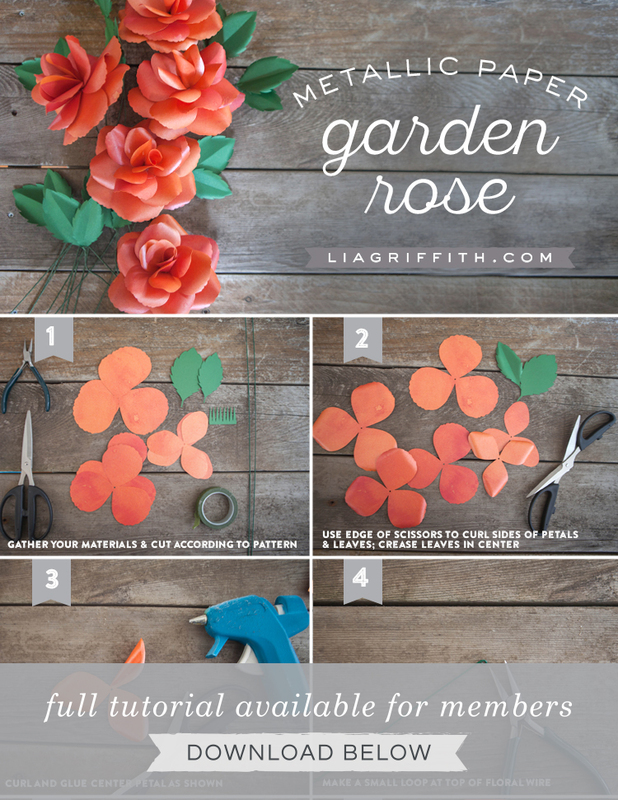 Save posts to your craft room with the Lia Griffith membership. Sign up for our newsletter and Lia's daily blog posts will be delivered straight to your inbox. Simple! Check your email for a link to confirm your subscription. You're already subscribed. Thank you! *You will automatically be added to our happy mail list, but you can unsubscribe at any time!